There's mu ch to gain when selling real estate and acquiring replacement property through a 1031 tax deferred exchange, commonly known as a Starker exchange or like-kind exchange. 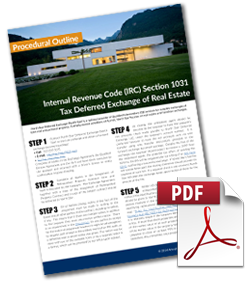 The completion of a 1031 exchange is a form and rule driven process, which may at first appear daunting. In this procedural outline, we've broken the 1031 like-kind exchange process into an explicit and easy to follow series of steps.